Bienvenido to the land of the Incas! Ride in Peru on a Suzuki DR650 group tour led by Jay. We head north from Lima up the Pan-American Highway and then head inland to experience the mighty Andes, crossing 15,000 foot passes. Ride from sea level to over 15,000 ft! Arrive in Lima and we transfer from the airport to Miraflores for an overnight stay at Hotel Carmel. The area is ideally situated close to all amenities and nightlife. You can get an early night to get over jetlag or have a short walking tour and learn a few Spanish phrases for the trip ahead. We drive up the coast in a 4×4 jeep to Barranca, which is about three hours away. Once there, you get to meet your Suzuki DR650 and perhaps give her a name. Get acquainted with your bike by a short ride to the Chimu Temple ruin near Paramonga and explore the small port there. The first full day of riding and we shoot for the top. From the coast, we head inland and up and over the snow-capped Andes crossing 13,000 ft passes and coming down to the mountain town of Hauraz with grand views of the Cordillera Blanca (Spanish for White Range). Huaraz is the winter sports capital of Peru and has a great atmosphere with climbers and trekkers passing through on their way up the peaks. We head for a day ride up to the snowline at Pastorouri and then the well-preserved ruins at Willkawain from the Huari culture. If you like, you can relax the muscles at the thermal baths at Monterrry just outside town. We head out from Huaraz and down the Santa Valley and then ride up to Parque Nacional Huascarán and the glacial lake of Llanganuco. Get high in the sky by summitting La Union Pass at 15,480 ft and being eye-level with Huascarán, the highest peak in Peru. On the way down, we pay homage at Yungay, a village that was completly buried by the massive earthquake here in 1970. From there we head into Caraz. A day off the bikes to visit the pre-Columbian ruins of Chan Chan and the pyramid of Huaca de la Luna. Chan Chan is an UNESCO World Heritage Site that was built in AD 850 and covers a large area. The adobe city provides clues as to how people lived here more than a thousand years ago. The nearby Huaca de la Luna (Temple of the Moon) resembles the mountain of Cerro Blanco that is right behind it. This religious and ceremonial site gives insight into ancient burial practices. After the tour of the ruins, relax by the beach for we have three riding days coming up. We ride north on the Panamericana with the Pacific Ocean on your left and the Sechura Desert on your right. The winds are always strong, so get ready for a shoulder work out. We overnight in Chiclayo, a fun Peruvian city with lively evenings in the central plazas of Parque Principla and Plazuela Elias Aguirre. Dig in to some tasty Peruvian cuisine such as “ceviche” (raw fish marinated in lemon juice) and “arroz con pato” (duck with rice). From the coast, we head back inland up into the Andes, for a pleasant ride to the high jungle city of Jaén. The climate changes from the cool winds of the coast to a warm and humid climate as now we’re on the Amazon side of the Andes. From Jaen, we head south to the capital of the Amazonas Region of Peru. Chachapoyas is quite isolated from the rest of country and the road to get there makes for a fun ride. Today, we ride one of my favorite roads in the whole world, the Cloud Forest Route from Chachapoyas to Celendin. 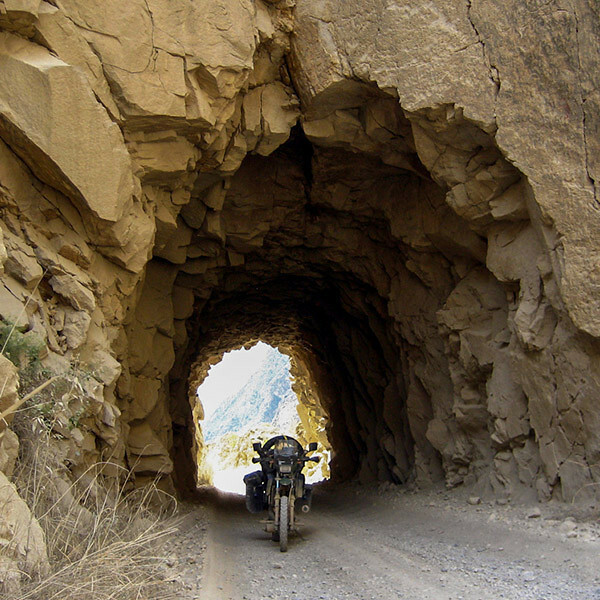 We pay a visit to the ruins at Keulap up at 10,000 ft and ride on clif-hugging single-lane roads. The elevation changes dramatically throughout the whole day as we go from one pass to the next before getting to the quaint mountain town of Celendin. It’s an easy ride from Celendin on twisting tarmac into Cajamarca as the riding comes to an end on this journey. Savour the last few miles. A day to explore Cajamarca. You can take a city tour, go craft shopping or enjoy the fine selection of restaurants and bars. Cajamarca has been inhabited for over 2,000 years by various cultures but the Spanish left the strongest impression with their grand cathedrals in the Plaza de Armas. This was the site where the last Inca king, Atahualpa, was defeated by the Spanish Conquistadors. You say good-bye to your DR650 and catch the flight from Cajamarca to Lima to connect with your international flight.